The Marshall County Council chose to increase the Innkeeper’s Tax from 3 to 5 percent. [Pilot News Article] I’ve had a disagreement with this tax since it first went into effect over a decade ago. My first issue is the same as Dr. Watson’s. (See his letter to the editor here.) It is taxation without representation. It was originally passed “because we could” rather than because there was a need. Now it appears that it has been raised using the same rational. From the Pilot News Article: “Woolfington [Convention and Visitors Bureau Executive Director] pointed out that Marshall County was one of just a handful of counties in the state of Indiana that has held the tax at 3 percent. Adjacent counties have raised their tax to the 5 percent level and St. Joseph County is at 6 percent.” Mr. Woolfington then goes on to talk about our loss of a major hotel chain. Somehow I doubt that this was because they suffered a decline in business because they weren’t charging enough! How is raising our tax rate to match surrounding counties going to attract people to stay here? My second issue with this has always been the Marshall County Visitor’s Guide. Despite the Innkeeper’s Tax, the first thing the newly formed Visitor’s and Convention Bureau did was to start shaking down local businesses and Chambers of Commerce for ads in their new visitor’s guide. Currently more than that 10% of the Culver Chamber of Commerce’s annual budget goes toward an ad in this guide. I was on the Culver Chamber Board when this went into effect and I voted against that budget item and the passing of the budget including that item until I left the board and I continued to vote against it as a Chamber member for several years after. (I now generally skip that meeting as my meal doesn’t sit well after that vote…) I considered it then and now a phenomenal waste of precious dollars…dollars requested by a tax funded entity of a volunteer organization. Dollars which wouldn’t need them if MCCVB was effective in it’s mission! A young man named John received a parrot as a gift. 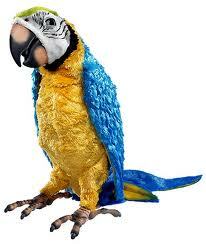 The parrot had a bad attitude and an even worse vocabulary. Every word out of the bird’s mouth was rude, obnoxious and laced with profanity. John tried and tried to change the bird’s attitude by consistently saying only polite words, playing soft music and anything else he could think of to ‘clean up’ the bird’s vocabulary. Finally, John was fed up and he yelled at the parrot. The parrot yelled back. John shook the parrot and the parrot got angrier and even more rude. John, in desperation, threw up his hand, grabbed the bird and put him in the freezer. For a few minutes the parrot squawked and kicked and screamed. Then suddenly there was total quiet. Not a peep was heard for over a minute. John was stunned at the change in the bird’s attitude. Friday was the Ribbon Cutting Ceremony for the LaPaz Garden Court. It’s always a great thing to go back and see how the facilities have been decorated, see the residents that have taken rooms and hear from all of those involved. Dr. Ronald Liechty served as Master of Ceremony and as always, made everyone feel good about the work that it took to bring the project to completion. We completed work on LaPaz Garden Court in mid-October and it is already 2/3rds full. There was actually another resident signing up while the open house was in progress! We were pleased that the H.U.D. representative for this job attended the ceremony. This is the first time this has happened. We were all pleased that she also had the opportunity to see the good that Garden Court has been able to do. This would not be possible with out the grants from H.U.D. LaPaz Garden Court is the 6th Garden Court project that Easterday Construction Co., Inc. has partnered with Garden Court, Inc. to complete. While we have also worked on several of their other projects, we have completed six projects from start to finish in Argos, Bourbon, Knox, Plymouth, Mentone and now LaPaz. We hope to be starting out 7th project with them, Culver Garden Court, within the next few weeks. All of us at Easterday Construction are proud of our association with Garden Court, Inc. and we hope to continue our partnership into the future. I was pleased to see a diverse representation of our County at the Community Conversation last Wednesday. Unfortunately I had a prior commitment and was unable to participate in the entire program, but I was able to hear the keynote speaker, Richard Longworth, as he spoke about the challenges Marshall County faces. He also took questions from the audience, which were insightful as well as indicative of where those in attendance thought we were headed. I hope this is the first of many such “conversations” about Marshall County’s direction for the future. Plymouth has just completed a Wheels of Progress survey. Culver’s Second Century Committee is in the process of reexamining their goals. I’m sure the other communities in Marshall County have their own steering committees to plan for the future. If I took anything out of the conversation Wednesday, it was that we all need to shake off the boundaries imposed by towns, counties and states. We should allow ourselves to think regionally and market ourselves in the same manner. Otherwise we will continue to be left behind. Mr. Longworth indicated that the Midwest didn’t just enter a recession two years ago, but is 30-40 years into a recession that could last a century if we’re not careful. Something for all of us to think about! The Walorski/DonnellyCongressional Race for the Indiana 2nd District was a pretty bitter fight. It was a pretty tight race up to and including the final days of the race. 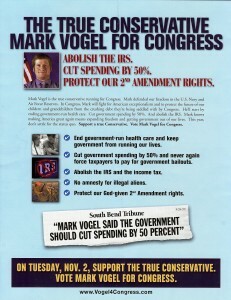 Interestingly, there was a Libertarian, Mark Vogel, in the race. 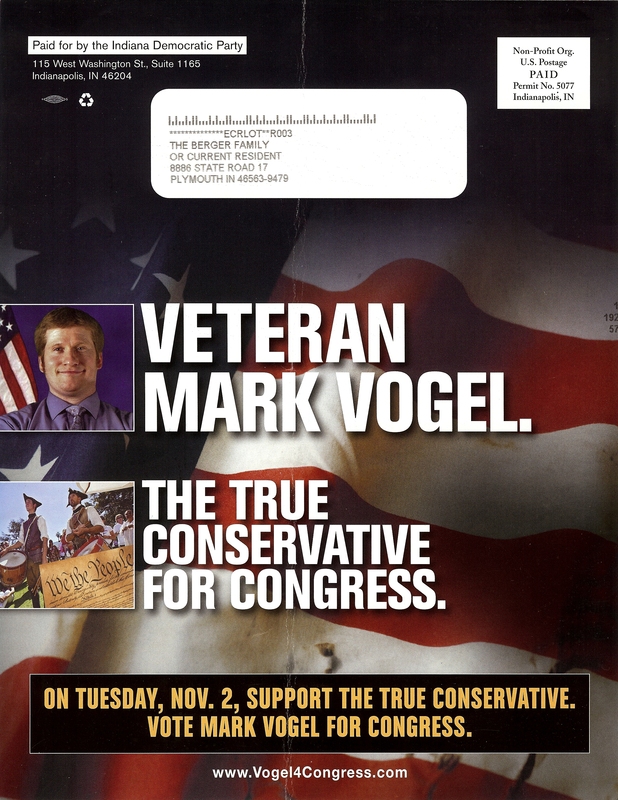 I consider myself fairly politically savy, but I was unaware the third candidate until the weekend before the election when I received a glossy mailer touting Mr. Vogel as the “true conservative” in the race. Despite serious campaign fatigue it caught my eye because of some of the positions being proclaimed, such as abolishing the IRS and the income tax. All of them were conservative to the extreme. 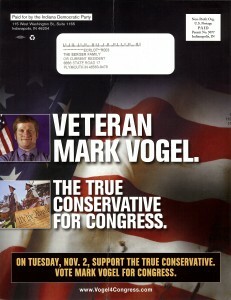 Looking at it a little further, another thing caught my eye… The return address: The Indiana Democratic Party! Whether you want to call it dirty pool or extremely smart politics, apparently the Indiana Democratic Party didn’t think Joe Donnelly could beat Jackie Walorski in a head to head battle, so chose to spend precious dollars on promoting the third candidate. Also, it appears they were right since the majority of those voting did not vote for Mr. Donnelly. 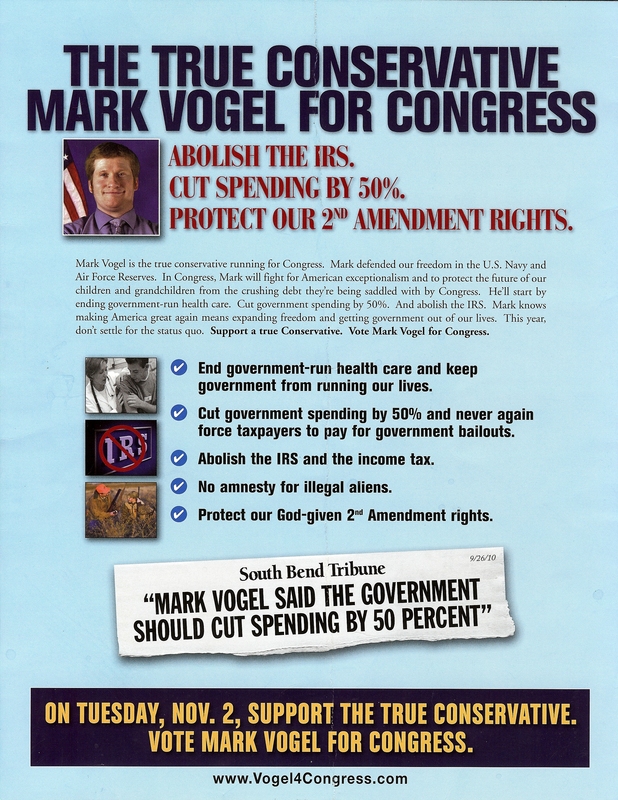 According to Mr. Vogel’s website, the ad was sent without his knowledge or consent, nor was it sent with the consent of the Libertarian Party. A complaint has been filed with the FEC for violations of Federal election laws.